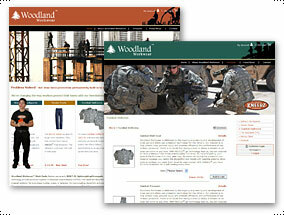 This site is designed to compete with such names as Carhartt, Redkap, and BlakLadder in the workwear/uniform market. Design efforts integrate with those used in offline efforts to provide a unified brand for this new/innovative product line. Product information is easy to find and the visual representation speaks to the target audiences. Search Engine Optimization is ongoing. Laurie Anderson Design has just developed new site for the products line under the name Kneedz, replacing the sample shown - check it out!